A 35-year-old man has died after being hit by a heavy goods vehicle. 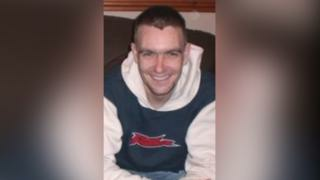 Michael Watkins died at the scene on the A48, close to the Cwmgwili junction in Carmarthenshire. Mr Watkins, who was from nearby Cross Hands, was on foot when he was struck by the lorry at about 01:20 GMT on Sunday. A Dyfed-Powys Police spokeswoman said officers were trying to trace anyone who saw a man walking along the A48 close to that time.